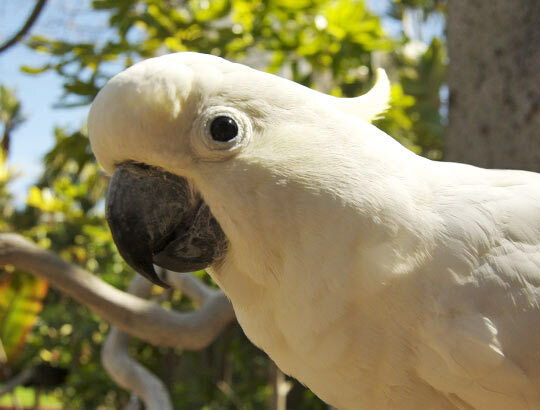 Meet the friendly parrots that call the Catamaran resort home. 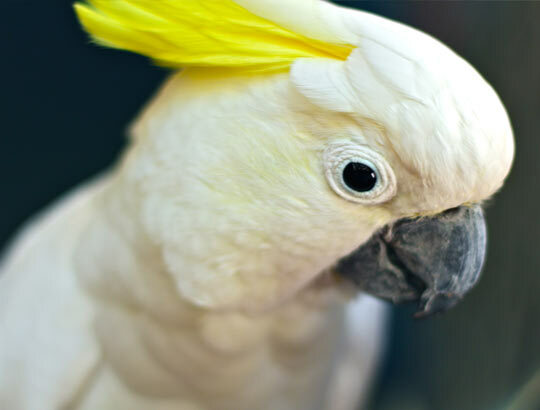 Bianchi, Chadwick, Cornell, Mercer, and Scooter are available to visit without being on-property with this fun and convenient online live camera feed of the colorful birds. 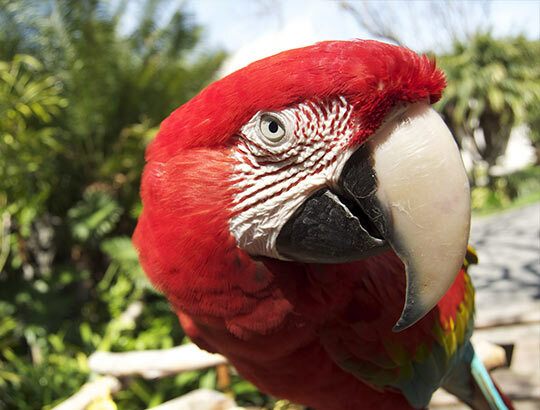 The parrots are available to view outside daily, between 10:00 a.m. and 3:30 p.m. pacific time, depending on the weather. 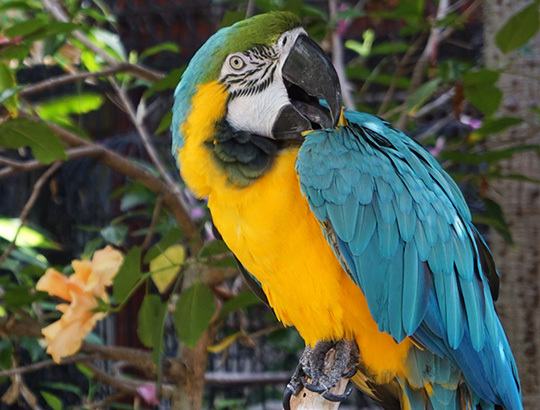 At the Catamaran, get up close and personal with several species of birds including vibrant macaws, beautiful cockatoos, and a lilac-crowned amazon. 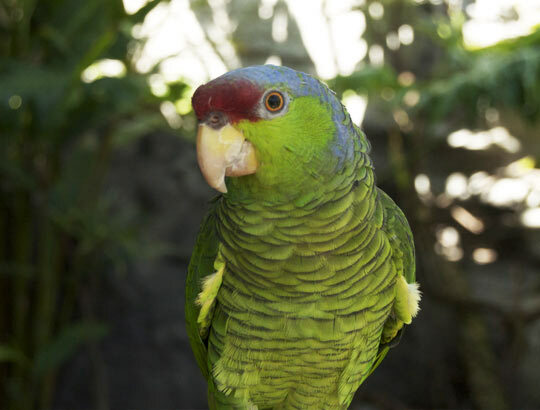 Learn a little more about the personalities and backgrounds of the these captivating parrots. Bianchi was hatched at the San Diego Zoo and came to live at the Catamaran Resort Hotel and Spa when he was just 7 months old. Bianchi likes to entertain with his talking animal impressions and pranks. He can often be heard flirting with women guests. Chadwick was only 6 months old when he came to the Catamaran. A veteran escape artist, he likes to take unsupervised walks, usually to Moray's Bar to beg for peanuts and look for new friends. Cornell was hatched in West Hollywood and came to the Catamaran when he was 7 months old. He immediately acclimated himself to "on-camera" life at the hotel and quickly became a favorite with the guests. Scooter came to live at the Catamaran in the spring of 2001. Her active antics and sweet voice have made her a favorite among the guests. 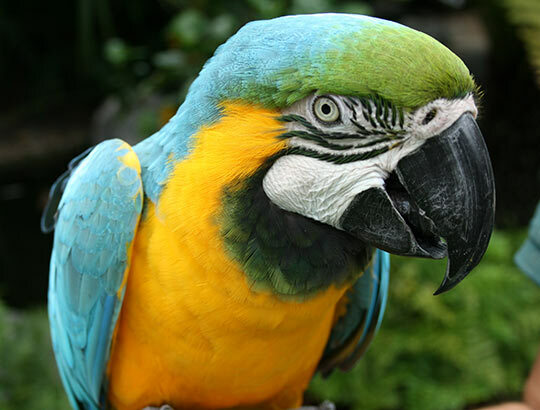 Mercer is a female Macaw who was hatched at the San Diego Zoo and came to live at the Catamaran when she was just 2 years old. Mercer is not a big talker, but if she happens to see someone she likes she will welcome them by bowing her head followed by a very excited "hello". Lovely Rita joined the Catamaran flock in the spring of 2016 and has been charming guests with her dramatic beauty and adorable voice ever since. Lively and playful, Rita especially enjoys her colorful toys.